Those are just a few of the rave early online reviews from users of a new Android mobile app that helps motorists figure out the best time to enter the United States at crossings from Mexico and Canada. “Best Time to Cross the Border” is a new service that is accessible on the Web – http://traffic.calit2.net/border/ – and also as an Android app via https://play.google.com/store/apps/details?id=net.calit2.ports the Android Market (aka Google Play). Border crossers can also search for the Android app under the name “Best Time to Cross the Border” in the Google Play store. The new service is the product of engineers and computer-science students at the University of California, San Diego, who work in the California Institute for Telecommunications and Information Technology (Calit2). The free app builds on other services that Calit2 offers free of charge to the public, including the California Wireless Traffic Report, which facilitates access to information on commuting times in the Bay Area, Los Angeles, Orange County and San Diego County. According to a study by the San Diego Association of Governments (SANDAG) and Caltrans, nearly 340,000 people travel every day through the San Ysidro, Otay Mesa and Tecate border crossings linking California and Mexico’s Baja California. The study estimates that more than eight million trips across the border are lost because travelers are unwilling to deal with the congestion and an average wait time of 45 minutes. “This equates to a loss of nearly $1.3 billion in potential revenues, mostly in the retail sector,” SANDAG concluded. “Excessive border waits also are affecting overall regional productivity,” pushing the San Diego region’s total economic loss as high as $2.5 billion each year. In addition, the typical two-hour delays facing trucks at commercial crossings into San Diego County cost the county $455 million in annual revenue from reduced freight activity. Border wait times are compiled by the U.S. Customs and Border Protection Agency and updated hourly. 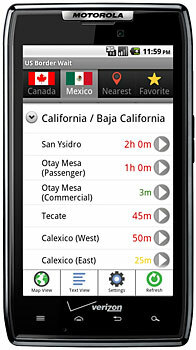 The developers at UC San Diego download that data within minutes so users of the Android app or the related Web site – http://traffic.calit2.net/border/ – can click on any border crossing and see current waits for passenger vehicles, commercial vehicles, and even pedestrian queues where they exist. The border agency’s current wait times are supplied by border agents, who ask commuters how long they waited to cross the check point. The data is made available on the agency’s own Web site, but it is easily misconstrued. When a commuter informs the border agent at, say, 10 a.m., that he or she has been waiting for two hours, the government site displays the wait time at 10 a.m. as ‘two hours’. But if the motorist arrived at 8 a.m. and had to wait two hours, that would have been the wait time as of 8 a.m. (when the wait began). “We take this into account and time-shift our graphs to correct this discrepancy,” said Chockalingam. 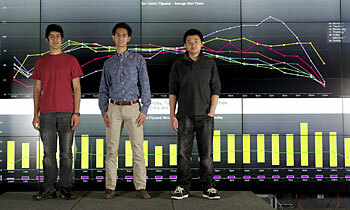 The new service was largely built by three student programmers from the UCSD Jacobs School of Engineering’s Computer Science and Engineering department. First-year Master’s student Gen Liu developed the Android app; freshman Rustin Manafian designed the mobile Web; and senior Patrick Guan created the Web front end. 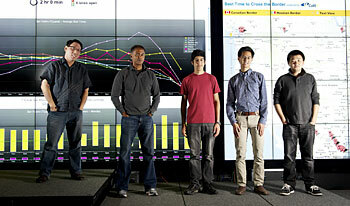 Data collection and front-end programming was overseen by staff Web developer Mike Chiu, and Ganz Chockalingam conceived the idea for the project. The Border Wait app went up on the Google Play! site last week, and it will soon be available for download through Amazon. On the Web, Caltrans is now linking to the Border Wait site from its San Diego real-time traffic map at http://www.dot.ca.gov/dist11/d11tmc/sdmap/showmap.php (see “Border Crossing Wait Times” under Quick Links). Calit2’s Chockalingam says his group his waiting to see the response from travelers to the new Android app and Web site, and if a lot of people download the service, an iPhone version is likely to follow. 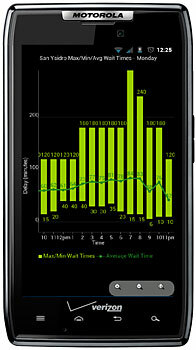 Calit2 already offers an iPhone App for its free wireless traffic service. Download Android App on Google Play!